If you don't know how to deal with emotional eating, your diet may fail. Emotional eating, also called stress eating, can sabotage your best weight loss efforts. But if you can learn to manage stress eating, you'll set yourself up for both short term weight loss and a life of healthier eating habits. Getting a handle on your tendency to eat in response to emotions can be one of the most important factors in getting the body you deserve. Sometimes, the desire to eat has nothing to do with a pesky rumbling in your stomach telling you that you need to eat. Occasionally, you might get a strong craving for certain foods, such as fattening, comfort foods. You might also happen that these cravings occur during times when you are also experiencing strong emotions. There are certain signs that can help you identify stress eating. But if you find that you eat when you are anxious, sad, depressed or worried, it's likely that you are an emotional eater. It is at times like these that you are also more likely to overeat or mindlessly overconsume calories. For some people, a major life event or change may trigger emotional eating. For example, if you get fired or are going through a divorce, you may start to eat to calm stress. But for others, this eating style is a constant struggle. It becomes a habit that you adopt in traffic on the way to work, when you're anxious on the job, or when you've had a tough day at the office. Your simple daily grind can lead to a seemingly unbreakable habit of turning to food to make it all better. There are also more serious reasons that emotional eating might develop. For example, overeating can become a way of dealing with childhood trauma or abuse. In these cases, your best approach is to contact a behavioral expert, such as a social worker or psychologist, who specializes in the treatment of eating disorders or childhood abuse. So what happens if you don't address emotional eating? The worst part about stress eating is that it causes your problems to multiply. Eventually, instead of avoiding the issues you're stuffing down with food, you've created another one altogether, including weight gain, guilt about eating, or worsening health. Then the stress—and the eating cycle—starts all over again. 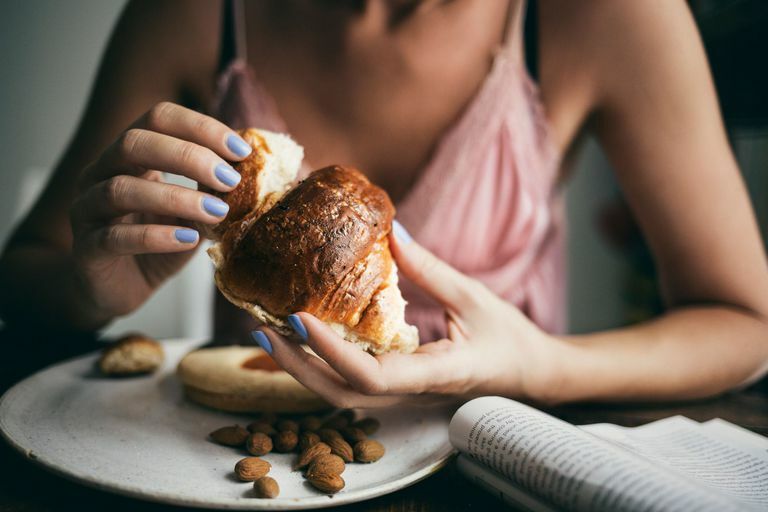 If you tend to give in to emotional eating, there are a few tactics you can use to regain control of your eating habits and get back on track. Identify Your Triggers. Start to keep a food journal and write down what you eat, when and what was happening at the time of your meal or snack. Then use the information to learn why you eat when you're not hungry. Recognize Hunger Signals. Learn the difference between real signs of hunger and emotional hunger. Once you recognize the cues, it will become easier to act when you see an emotional eating binge start to happen. Limit Trigger Foods. Get rid of the foods you're likely to binge on. Then reorganize your refrigerator and pantry for healthy eating and weight loss. Fill your kitchen with healthy snacks and ingredients to create diet-friendly low-calorie meals. Don't Skip Meals. Skipping meals almost always lead to over-eating. Create a healthy meal plan so that you eat every 4-5 hours so you avoid real hunger signs as well. Create Alternatives to Eating. If you've had a tough day, find healthier ways to relax. If you find that you eat when you are tired, find natural ways to boost your energy. And if you want to celebrate a success, find diet-friendly ways to reward yourself without food. Lastly, don't give up if you slip. It's hard to stop emotional eating. When you trip up, forgive yourself and start over the next day. Learning from your mistakes and focusing on the positive will go a long way in ensuring your continued weight loss success.